Just bought 450 xc limited exhaust choices. Thread: Just bought 450 xc limited exhaust choices. What are you guys running. Looking for a full exhaust system and jet kit. It looks like once upon a time there was lots of choices. I’m having a hard time. Please help. eBay looks to be the best place to look . Yosh and HMF were the better ones to use. I sent bills a email. They don’t have any listed on their site. He has listings of his exhausts on his website. You have to call him to order, I don’t know if he replies to emails, I’ve never tried. Got a reply from bills they no longer manufacture a exhaust for the Ktm atv. I think you may be looking at the wrong site. 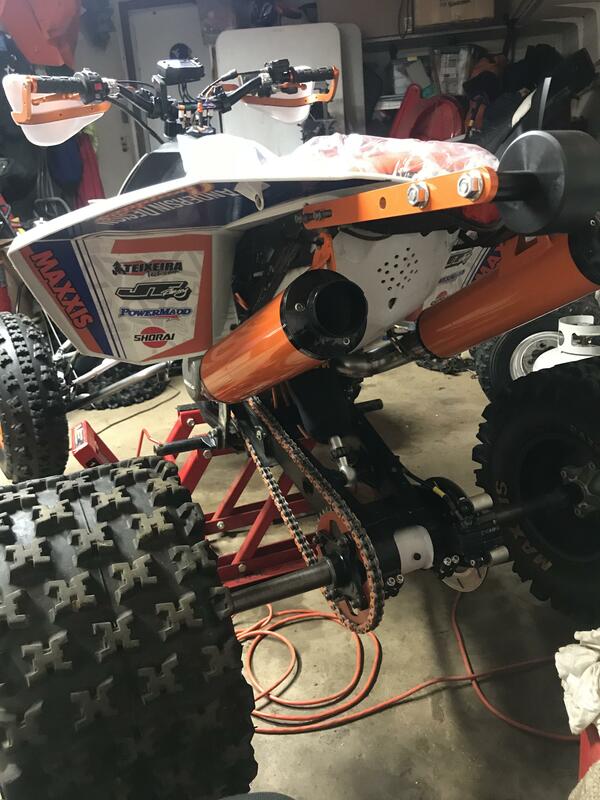 I have also been looking at pipes for my 450XC and seen that there is a Bill's pipes website but that is not the same as what is know on this site as KTM Bill. You need to look here Home. I emailed Bill just a week ago and he said he still makes the pipe and is 2 weeks out after full payment is received. From what I've read the ktm bill exhaust is the best of the best for our bikes. 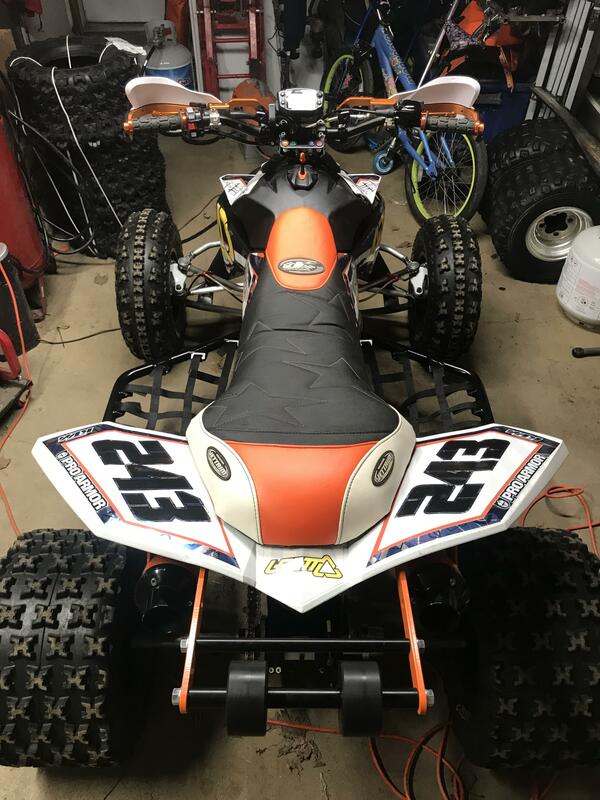 I am currently struggling between the ktm bill full exhaust and the dasa slip on, mainly because of price and the fact I have no intentions of racing my bike just want a little extra for the dunes and of course the sound. As far as jet kit do so research on fastranchero's carb mods. Really? I know for a fact that he is building one right now for a friend of mine who is a member here. Bill custom makes them to order and my friend should have his soon. Yep. Found it. Thank you nat05. Any one have any pic of what it looks like? The site is not bills pipes, it’s under all4racing. We call him KTM bill on this site. Last edited by Youngwildandfree; 01-30-2018 at 01:18 AM. For slip on silencers look to HMF or FMF. For full systems look to All4Racing (which is KTM Bill not Bill's Pipes), CT Racing, or HMF. On our XC quads we are running the Akrapovic systems that were available through KTM, but are sadly discontinued. Best fit and finish I've ever had on a pipe and the performance is there too. I do have an All4Racing pipe on my SX quad and it performs very well. Fit left a little to be desired and silencers was pretty heavy. That was a generation 2 pipe I believe. Last I talked to him he was on generation 4 I think so they are probably better fit now. As far as jetting goes I'd just go with the pipe manufacturer's recommendations to start. If you really want a kit the JD jet kit I had worked ok. If you want the best setup look up the "Ranchero Mod". Involves some drilling and tapping on parts of your carb and uses a Honda needle. It's more labor intensive but it works. Just keep in mind you will have different jetting with that option since the Honda needle runs much richer. Last edited by quad97; 01-30-2018 at 05:12 PM. 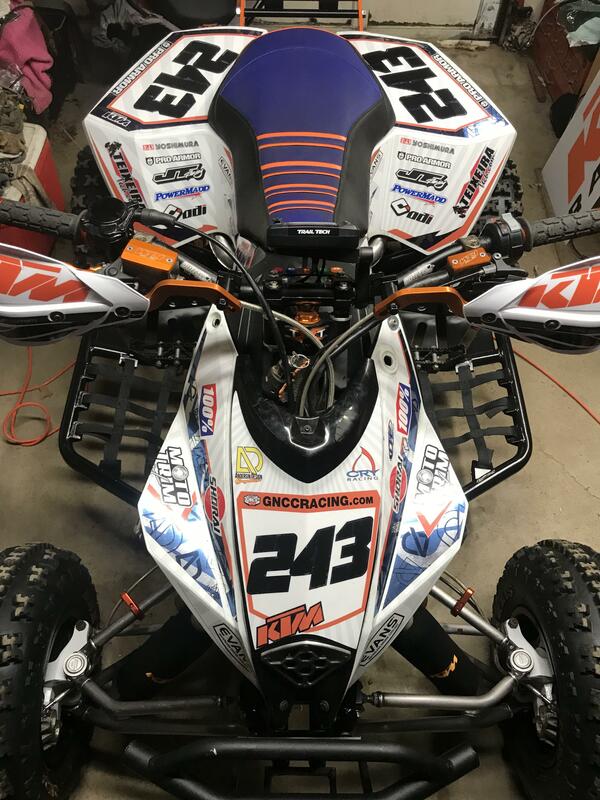 2017 Sponsors- Oneal, Amsoil, Twin Air, Elevated Powersports, and Chuck's Welding and Repair. Just got this from KTM Bill a few months ago. Best system hands down. That looks great. I've got a ktm bill on order myself, should be here soon. Did you get the sparky end cap? I have mixed feelings on the looks of the new end cap vs the old version I've seen in pics, not sure if the difference has anything to do with sparky or not. Do you have any other engine mods? Awesome. Looney Tuned? I would love to see more pics of your bike! Where did you get those hand guards? 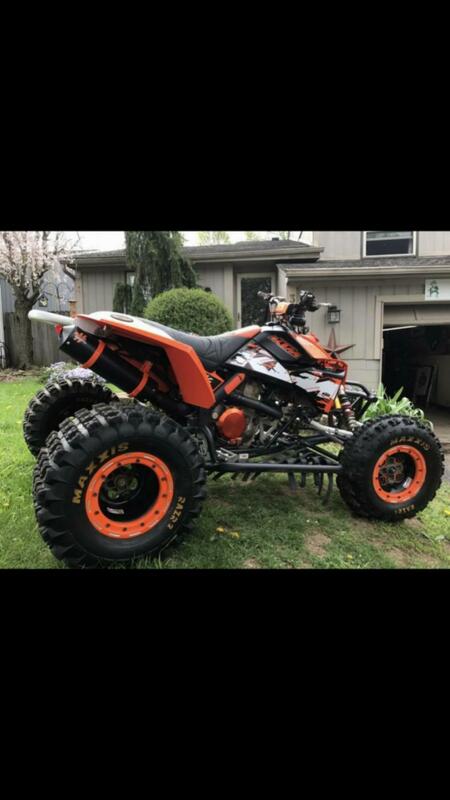 What kind of rear grab bar is that? Looks like a wheelie bar.! I like your seat too. Who makes that? Those hand guards are/were a KTM hardparts accessory for the dirt bikes. Get ahold of a newer bike accessory catalog and you should find them.